Last week, Casper asked me to explain why online multiplayer is taking us so long to get done. But before I do so, I would like to begin by mentioning that Speedrunner HD won the Dutch Game Award for Best Game Animation! The Dutch Game Awards are sort of the Oscars for the Dutch game industry so naturally we are pretty excited. Here’s a picture of all the award winners holding their giant golden cyborg owls; you can see Casper in the bottom left looking happy and a bit overwhelmed. Congratulations to Frank Post, our animator, and to the other winners as well (yes, even to Ronimo who bested us in the ‘Best PC/Console Game’ category)! 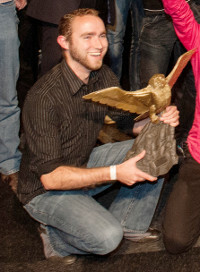 Anyway, the now (physically*) ‘award winning’ Speedrunner HD has become a bit of a victim of it’s own success. We started DoubleDutch Games back in 2010 with SpeedRunner as our first game. We never expected the flash game to do as well as it did (it has actually surpassed 10 million views by now!). And we also didn’t expect people to enjoy the local multiplayer as much as fans tell us now. The Xbox version of Speedrunner also opened the door to Steam, so all in all Speedrunner is doing much better than we had ever dared to hope it would. Anyway, I do want to provide you guys with some news, so I've decided to write some things on the new features that you can expect in the PC version of the game, and to post these once a week.